Philip Stead Books: MUSIC FOR MISTER MOON, a New Stunner! Do you love Philip Stead as much as we do? If you adore A SICK DAY FOR AMOS MCGEE, A HOME FOR BIRD, and SAMSON IN THE SNOW, you absolutely must check out MUSIC FOR MISTER MOON, his latest and greatest! Teaching perspective to little ones is not always easy, but Rosie’s Glasses, a new favorite children’s book about perspective, will definitely help. Check it out! I love when children begin to understand the power of voice, when they come to realize that their words carry significant weight. And Peter H. Reynolds’ new book, Say Something!, is a fabulous celebration of the many ways in which our kids can make their voices heard. Books About Strong Girls: Ruth Bader Ginsburg, Courage Personified! We love books about strong girls here at Happily Ever Elephants, both for our girls AND our boys! And I Dissent: Ruth Bader Ginsburg Makes her Mark, is one of the best books about strong women you will ever find. Antisemitism. Child Labor. Social Justice. These are some of the issues that have always been critically important to me - to understand, to work towards, or to fight against. So when these problems are explored in a beautifully written, fantastical story about one child’s struggle with her position in society and her relationship with an unconventional new friend, I want nothing more than to shout about it from the rooftops and share it with every child, parent and educator I can. Enter Sweep: The Story of a Girl and Her Monster, by Jonathan Auxier. When I tell you this book sucked me in and I couldn’t put it down, I speak the honest truth. I was utterly captivated, from beginning to end, and I now want to read every single story ever written by Auxier. What a brilliant writer! Sweep is the story of Nan Sparrow, an orphaned chimney sweeper who spends her days performing a thankless — and wholly dangerous — job. After her “Sweep” leaves her, and after she almost loses her life in a chimney fire, Nan fears her days are numbered. But when she awakens in an abandoned attic and discovers a golem made of soot and ash in the room with her, she begins a new life full of hope, friendship and the courage to conquer her greatest challenges. I love stories that teach without being didactic, ones that encourage you to make new discoveries every time you open their pages. Sweep is that and so much more - a book that tackles tough topics and follows Nan as she puts one foot in front of the other after facing so many unspeakable losses. Sweep is separated into two sections, appropriately called Innocence and Experience, and they so beautifully illuminate Nan’s journey from a guileless young child to a tween fraught with complicated questions and even more troubling realizations about society and her place within it. Why are children forced to work dangerous jobs? Why are kids losing their lives due to nothing but their unfortunate lot in life, and what on earth can she do to change it? Simply put, Sweep is a feat. It is an adventure of the greatest kind, an ode to friendship, a discovery of self, and a testament to the power of one voice to create change. But my favorite part? Sweep excels in its exploration of “monsters,” finds tenderness in the terrifying, and combats all of our preconceived notions about the frightening things that keep us up at night. Exquisite - this marvel will stay with me for a long, long time. Want the book? Get it here! Sweep: The Story of a Girl and Her Monster, by Jonathan Auxier. *This is an affiliate link. There’s something about Those Shoes, written by Maribeth Boelts and illustrated by Noah Z. Jones, that calls to me every November. And so each year, the week before Thanksgiving hits, this is the book I pull out to read to every single one of my elementary school classes. And each time, without fail, when my students see me pull the book out from behind me, they clap and cheer. Those Shoes is beloved by our school, and it fills me with such joy to see student reactions to this story. Jeremy wants nothing more than the same pair of shoes that the rest of the kids at school wear. But, according to his grandma, Jeremy’s “wants” are not nearly as important as his “needs.” When his shoes fall apart at school, Jeremy is both ashamed and embarrassed that he has to wear babyish sneakers given to him by the school guidance counselor. So when his grandma takes him to the thrift stores, Jeremy is in heaven when he finds a pair of THOSE SHOES- and he buys them with his own money even though they are too small and destroy his feet. Leave it to grandma, though, to sneak a new pair of warm snow boots into Jeremy’s closet. What happens when Jeremy’s friend, Antonio, the only boy who didn’t laugh at Jeremy’s babyish shoes, comes to school with taped up sneakers, and his feet are noticeably smaller than Jeremy’s? Those Shoes is an honest and poignant story. Before I begin reading this with students, I always start with a discussion of the differences between wants and needs- it provides such an amazing entryway into the book. After we read, the maturity and depth of conversation usually skyrockets. Why? Because the book so beautifully conveys that the things Jeremy has - family, new snow boots to protect his feet, and the opportunity to help someone in distress - truly are more valuable than holding on to something he wants because it’s “cool.” Often times, the things we so desperately “want” don’t bring us nearly as much fulfillment as the things we need. You can practically see the wheels spinning in the kids’ heads after they read this book! Those Shoes offers a perfect segue into a discussion of gratitude and the countless things we have to be thankful for. It also reminds us that there are so many ways we can help others less fortunate during the holiday season and all year round. Want to #gettrunky* with it? Here’s an easy and quick idea. If you are an educator, use the Padlet app (it’s free!) and create a Gratitude Wall. I used a simple prompt- “what is one thing you are thankful for and why?” I made sure to limit student responses so they would have to think more deeply - thus, they were not allowed to answer with “family,” “friends” or “food.” Using their school devices, the students could write, draw, photograph or video their responses. The result? A beautiful, interactive bulletin board, showcasing the things our students value most, from backpacks (because they hold tools used to create!) to names of teachers (because they teach us and help us learn every single day), to the ability to dance (because dancing is a way to express myself). The results will both astonish and surprise you. *What on earth does it mean to #gettrunky? Click here to find out! Want the book? Get it here! Those Shoes, by by Maribeth Boelts and illustrated by Noah Z. Jones. *This is an affiliate link. If you love kids books about kindness and you are working hard to teach your child about always using kind words and having a kind heart, then you’ve got to check out this amazing book, BE KIND! If you have never read a story by Kate DiCamillo, prepare to get swept away by magic. If you are already a fan of Kate’s work, then prepare yourself for another mesmerizing character and another extraordinary story. From the second you open the first page of Louisiana’s Way Home, you are so clearly in the hands of a brilliant storyteller. DiCamillo simply plucks you off of the couch/bed/chair where you are curled up reading and drops you squarely in the middle of her world. That’s how vivid Louisiana’s Way Home is- that’s how magical each and every page. Louisiana’s Way Home is a companion book to Raymie Nightingale. In it, we revisit one of the three girlfriends, Louisiana Elefante, of circus family fame. But our story begins not in Florida, and instead with Louisiana and her granny on the run - they have left Florida in the middle of the night and are driving straight up to Georgia, where they must stop when Granny suffers from a horrific tooth ache. And so it is that the pair winds up at a motel, and when Granny up and leaves again - this time without her granddaughter - Louisiana fears she is destined for only goodbyes. There is a curse on her head, after all. When Louisiana learns a painful secret, her past unravels before her eyes and she must decide what she wants — and who she wants to be. “I want you to know something, Louisiana. We all, at some point, have to decide who we want to be in this world. It is a decision we make for ourselves. You are being forced to make this decision at an early age, but that does not mean that you cannot do it well and wisely.” Tears. Streaming down my cheeks. These characters, this voice. These decisions. Standing at a crossroads is tough- no matter the age. But when we reach this point, we have big choices to make. We have to decide if we want to forgive, and if so, how? We have to decide if we want to move forward, and if so, how? Most importantly, we have to strive to believe in love, compassion and generosity. Because without that steadfast belief, we may truly lose our way home. Louisiana’s Way Home is a beauty; perfectly paced, impeccably plotted, and the most compelling hero’s journey i’ve read in some time. I savored every word and every character, and I am already eagerly anticipating the third installment in this trio of books. TWO TRUNKS UP! Want the book? Get it here! 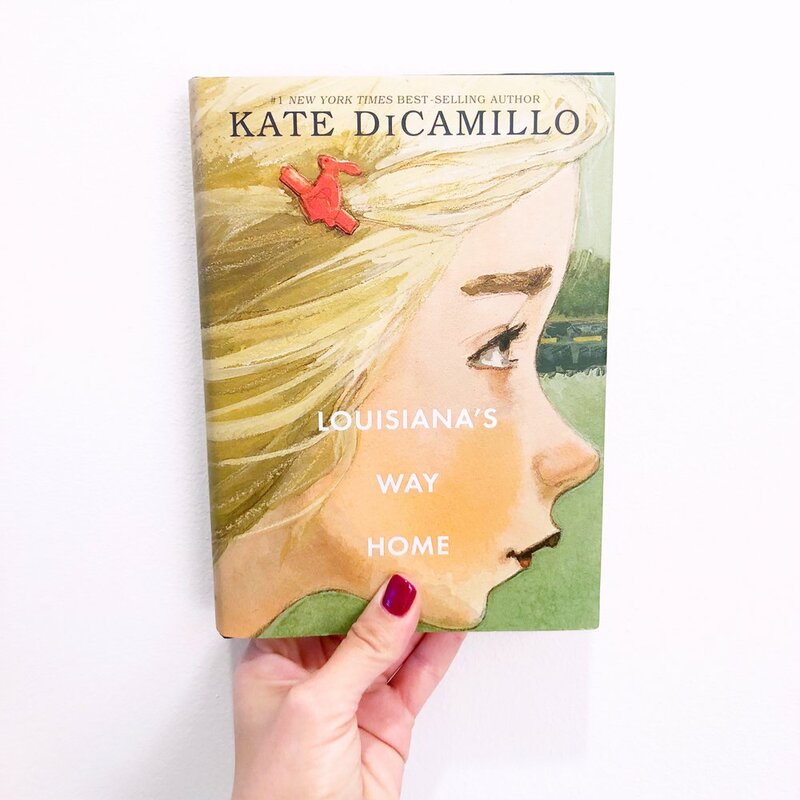 Louisiana’s Way Home, by Kate DiCamillo. *This is an affiliate link. HEE received an advanced copy of this book from the publisher, but all opinions contained herein are entirely our own. Use your words. It's a phrase parents and educators know well. It's one of the first things we teach our children when they begin to speak. "Use your words," we say, when they are pointing instead of asking. "Use your words," we remind them, when they are hitting instead of talking. It’s one of the mantras that plays like background music - a soundtrack to those infamous toddler years - because getting our children to use words instead of hands is pretty critical. And as important as it is to instill in our children, it is of utmost significance that adults, too, follow and live by this mantra. This is perhaps why I have always been intrigued by Mahatma Gandhi and his belief in nonviolence to create social change— his belief that words possess more power than punches. I am thus thrilled to be a part of the I Am Justice blog tour to share Brad Meltzer's fabulous book, I am Gandhi, an empowering story in the Ordinary People Change the World Series. We adore this series, especially I am Gandhi, for the way it teaches children that violence is never a means to an end. I am Gandhi tells the story of how Gandhi, as a young man, was appalled by the unequal treatment of Indians. Refusing to tolerate injustice, Gandhi came up with a brilliant and powerful plan to protest discrimination against Indians in South Africa and to end British rule in India. Like the series' biography of Martin Luther King, Jr., Gandhi's story focuses on peaceful heroism in the struggle for civil rights and social evolution. One of the reasons I so love this book is because Gandhi's peaceful, nonviolent teachings can be understood by children of all ages. His beautiful words can teach kids how to create impactful change without violence and aggression. I am Gandhi can be read in a variety of ways within your home or classroom and paired with so many complementary learning and literacy activities. Have your kids or students write peace pledges, identifying how they can use their words to embody peaceful action in their schools and homes. Have students identify problems in their communities, and brainstorm peaceful ways to tackle and address these challenges. Create kindness concept posters to showcase the many ways in which we can peacefully address conflict. The possibilities are endless… and if we emphasize Gandhi’s message of nonviolence, our kids will be at the forefront of a kinder, more respectful, and more empathetic generation. Can we ask for anything more? Want the book? Get it here! I am Gandhi, by Brad Meltzer and illustrated by Christopher Eliopoulos. HEE received a copy of this book from the publisher, but all opinions expressed herein are entirely our own. “Own Voices.” It’s a prominent term in the children’s literature world right now. What is it, you ask? Own voices is a term coined to describe books written by authors that share a minority or marginalized trait with their main character. So in other words, these books aim to provide a more authentic perspective, then say, a white author writing about a Muslim main character, or an able-bodied author writing about a protagonist with a signifiant physical disability. 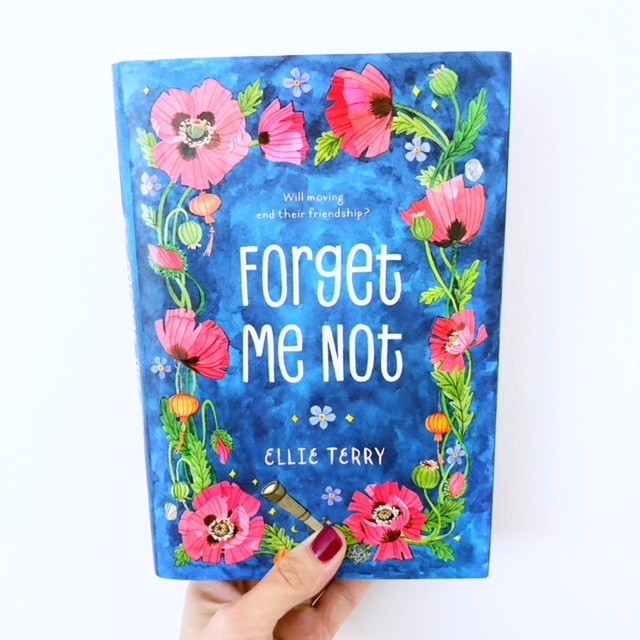 When I learned about Ellie Terry’ Forget Me Not, an "own voices” novel in verse about a young girl struggling with Tourette’s Syndrome, I was immediately intrigued and couldn’t wait to get my hands on it. Forget Me Not tells the story of Calliope “Callie” June, a seventh-grader with Tourette’s Syndrome who is constantly on the move with her mother, which means she is constantly having to start over at new schools. And what does that mean? It means Callie is constantly having to find ways to hide her embarrassing disorder that makes her so different than the rest of her classmates. When Callie arrives in a new town and makes friends with her neighbor, Callie finds something that resembles the smallest sliver of happiness. So what happens when Callie discovers that her mother might make her move, yet again, right as Callie is on the cusp of something special? Forget Me Not is written in verse from Callie’s perspective and in prose from the perspective of Callie’s neighbor, Jinsong. Callie’s desire to be accepted among her peers is both honest and gut-wrenching as she struggles to understand her Tourette’s and hide it from those around her. But hiding it is impossible, and when her behaviors are on full display at school, the cruelty she experiences is heart breaking. Callie’s poetry is lyrical, deep and, at times, breathtaking. Add to this Jin’s story - one in which we feel his immediate affection for Callie, but watch as he struggles with own internal conflict: can he maintain his “cool” among his peers and still befriend the “weird girl”? Or will he risk social suicide by letting anyone realize how much he adores Callie? Their intertwined stories explore acceptance, connection and confidence, and the two share a heart-felt story you don’t want to miss. Want the book? Get it here! Forget Me Not, by Ellie Terry. *This is an affiliate link. There is nothing more exciting to a self-proclaimed book nerd than a “meta” picture book that plays with form and storytelling in a truly unique way. What is "meta" fiction, you ask? A book described as “meta” is one that bends the traditional rules of storytelling, thus presenting the reader with something unique, surprising and even challenging. And so it is with the latest story by the brilliant Jon Agee, The Wall in the Middle of the Book. Folks, Agee hits a total SLAM DUNK with this one. I’ve read it a good twenty times since I’ve gotten it, and each time I read it, I find myself writing down another terrific discussion point. In The Wall in the Middle of The Book, there is literally just that- a wall running along the gutter of the book. On one side of the wall stands a knight who proudly proclaims he is safe. The dangers, after all, live on the other side of the wall. So what exactly is on that other side? Angry animals and evil ogres, of course. What the knight doesn’t realize, however, is the rising water and the crocodile looming on his side of the wall. When the knight finds himself in need of help, the one who comes to his rescue may be a whole lot different than the knight anticipated… and the other side of the wall may possess a lot more fun than fright. There is a heck of a lot of power packed into these pages. The interplay between the text and the illustrations is something Agee handles masterfully (he employs this same technique brilliantly in Life on Mars, one of his previous books that is still a hit in our home - check out our review HERE!). There is so much discussion to be sparked from Agee’s genius story. Most importantly, though, is the simple, underlying message The Wall in the Middle of the Book coneys: there is tremendous danger in preconceived notions. Why? Because most of the time, they are not just wrong but extraordinarily harmful! Preconceived notions become dangerous both in our classrooms and in our society, and it becomes exceedingly difficult to scale the walls we build when we are simply too frightened to address the differences we see on the other side. Whether talking to young children about exactly what they see on these pages or older kids about the symbolic nature of this book as it pertains to xenophobia and so many other issues currently plaguing our country, The Wall in the Middle of the Book speaks volumes and can be utilized with readers young and old. This is a stand out work by Agee, and a definite favorite of 2018! Want the book? Get it here! The Wall in the Middle of the Book, by Jon Agee. HEE received an advanced review copy of this book, but all opinions expressed herein are entirely our own. Wow. WOW. It is not very often that I finish a book and want nothing more then to pick it right back up again, flip back to page 1, and read it cover to cover just one more time. But that’s exactly how I felt when I put down Harbor Me, a stunning new novel by Jacqueline Woodson. If I have said it once, I’ve said it a thousand times: Woodson is a gift to literature. Her words resonate deeply, and she possesses an extraordinary ability to tap into timely, almost desperate situations in a manner appropriate and gentle enough for young kids to grasp. In Harbor Me, six children are taken to their school’s old art room and told it’s a place for them to have a weekly chat— without teachers, thus making it totally unmonitored. The six kids, from varying walks of life, are hesitant at first. They each have their stories, but is it safe? Can they open up to one another? The room becomes dubbed the ARTT room, an acronym for “a room to talk,” and soon enough, their stories begin. As their connections develop and their words bridge divides, the students realize that sharing their stories could be the very thing they needed to give them the strength to handle circumstances that once made them feel so desperately alone. Harbor Me is stunning. At once both a coming of age story and an exploration of how America’s political and social challenges affect children daily, Woodson’s words ground us firmly in the ARTT room as the kids struggle to comprehend both their identities as individuals as well as their places in society. These children are America’s children. They are OUR children- children affected by the headlines pervasive in our country today including immigration, deportation, incarcerated parents, and the black lives matter movement. These children are in our homes and schools, and their confidence and self worth is being shaken regularly due to government regulations, racial profiling and harmful ignorance. Through Woodson’s evocative prose and magical storytelling, we watch the children become safe harbors for one another, their initial apprehension slowly turning into compassion, connection and perhaps most importantly, courage. Want the book? Get it here! 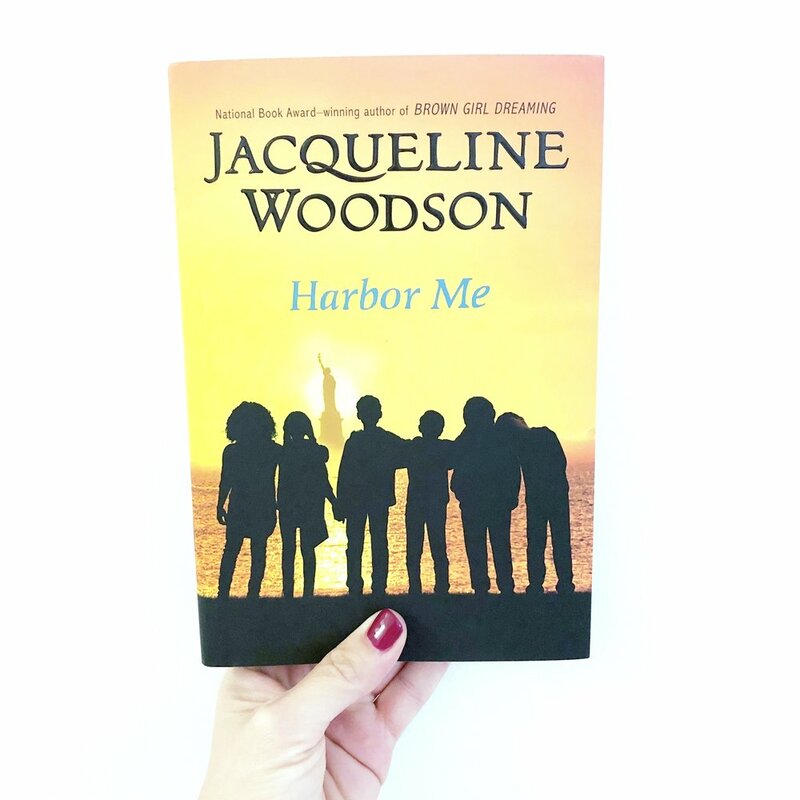 Harbor Me, by Jacqueline Woodson. *This is an affiliate link. HEE received an advanced review copy of this book, but all opinions expressed herein are entirely our own. If you’re following us over on Instagram, you know we’ve been on a strong and mighty girls kick, and here’s one more awesome read for your shelves that gives us glimpses into our world’s many vibrant cultures. I adore this gorgeous, re-issued collection of folktales featuring heroic women around the globe. Not One Damsel in Distress: Heroic Girls from World Folklore, is collected and told by Jane Yolen and illustrated by Susan Guevara, and its one you don’t want to miss. This is a diverse collection of stories featuring smart, strong and savvy women that I cannot wait to share with my smart, strong and savvy little boys. Did I say I want to share stories about female heroes with my BOYS? Heck yes, I did! Books featuring strong girls and female protagonists are not just “girl books.” It is crucial to share these books - both fiction and non-fiction - with our sons and male students. If we truly seek to change our country’s narrative for future generations, we must show our boys, starting at tender young ages, that reading about female heroes is just as necessary — and perhaps more importantly, just as FUN — as reading about male heroes. Frankly, it is time to level the playing field. Given the current state of affairs in America, this is not just significant, but vital to the functioning of our democracy. Women’s voices are just as critical as their male counterparts, and we need our boys to recognize this from the time they are born. Raising a generation of compassionate, respectful men begins with those of us who nurture and teach them in our homes and in our schools. Reading to them — true stories about real women as well as fictional books with strong female protagonists - is such an effective way to make a difference in our communities, which in turn helps affect greater societal change. And such change is critical, because the current social structures and the gender inequality so frequently displayed in our communities, workplaces and government is simply unacceptable. As parents and educators, it is up to us to change it. So grab Not One Damsel in Distress, add it to your strong girl book collection, and talk it to up your girls AND boys. Let’s give our children opportunities to see that heroes come in all shapes, all sizes and all genders. Want the book? Get it here! Not One Damsel in Distress: Heroic Girls from World Folklore, by Jane Yolen. *This is a affiliate link. HEE recived a review copy of this book, but all opinions expressed herein are expressly our own. I have read so few middle grade books touching upon a parent with mental illness, yet it affects an astounding number of adults in the United States. The National Alliance on Mental Illness notes that 1 out of every 5 American adults experience mental illness in a given year. Of these, 1 in 100 American adults live with schizophrenia. What do these staggering statistics tell us then? Mental illness is not taboo. And the fact that there are so many adults afflicted means there are children struggling to make sense of a parent’s disease. How can we help these children feel less alone and more understood? One answer is to give them books in which they can see themselves and their stories. Enter Where the Watermelons Grow, a powerful new middle grade novel by Cindy Baldwin. This beautiful book tells the story of Della Kelly, a tween girl whose mother suffers from schizophrenia. The book opens with Della’s mother digging seeds out of a watermelon in the middle of the night, talking to people only she can see, and Della at once knows her mother is being tugged back down a dangerous road that once landed her in the hospital for months. With her Dad distracted by trying to save the family farm and her mom spinning out of control, Della decides she is the only one that can heal her mama and save her family - and she refuses to let others in for help. Will Della be able to hold her family together as her mother’s symptoms worsen by the day? I love Where the Watermelons Grow for so many reasons. First, its tackling of mental illness felt authentic at every step. It provided gut-wrenching, yet age appropriate details of schizophrenia, giving children a glimpse into this disease in a way that felt both informative for those who haven’t experienced it, and trustworthy for those who have. More importantly, though, I loved Della’s emotional journey and the way in which she matured during the story. Our protagonist went from keeping her mother’s secret buried deep down, not only for fear of what others would think of her family but because of her own fear that she somehow caused or contributed to the sickness. Yet as her mother worsened, Della matured enough to understand that not only was she in no way responsible for the illness, but allowing others to support her would give her the love and strength she needed to survive. Community can be healing, but sometimes, we shy away from that very notion because letting others in to our family secrets can be downright frightening. Della’s eventual acceptance of her mother’s schizophrenia - and the recognition that it is not a badge of shame upon her family- resonated deeply and reminds readers that all families struggle with challenges, but there are always people who will be there to help. We just have to let them in. A beautiful, tender and poignant novel. For another, totally different yet wonderful read about a child struggling with a parent’s mental illness, check out our review of The Secret of Nightingale Wood, by Lucy Strange. Want the book? Get it here: Where the Watermelons Grow, by Cindy Baldwin. *This is an affiliate link. HEE received an advanced copy of this book from the publisher, but all opinions contained herein are expressly our own. Self Esteem Books for Kids: OLD HAT and Loving Our Odd Traits!! This is a fabulous self esteem book for kids who may be embarrassed by some of their rather unique characteristics, especially for your younger children. Check it out! So many of us have stood in that uncomfortable spot, right there in the doorway about to enter a room where the blanket of faces staring back at you look wholly different from your own. It's one of those feelings that is bound to make your stomach hurt or your eyes sting - especially when you're only a child. At that moment, all we see are the differences in those people: different skin colors and eye shapes, different clothing -- even different accents when they begin to speak. What we forget during these challenging situations, however, and what we need to remind our kids, is that underneath these different exteriors lie a multitude of similarities. This is the beauty of Jacqueline Woodson's newest picture book, The Day You Begin, stunningly illustrated by Rafael Lopez (you may remember him from one of my favorite books, Maybe Something Beautiful). The Day You Begin tells the story of a young girl who walks into a new classroom and finds no one like her. But then she sits down, her classmates begin talking, and as their words fill the air, shared sentiments become bridges to building connection. The Day You Begin reads like music, with rich melodies that rouse your senses and settle softly upon your heart. Woodson's words, as is typical for her, are a song to celebrate. She reassures us that, when we are brave enough, we can all find connections with one another. When we muster up courage and extend our hands and voices, we will find possibility where it first seemed like none existed. The Day You Begin conveys wisdom, hope and heart, on vibrant, collaged pages that are a perfect accompaniment to the exquisite text. This is a book to treasure, reminding both children and adults that there is so much beauty to be found when we embrace who we are and find the strength to view challenges as opportunities. We give this one two trunks up, and we have no hesitation in calling The Day You Begin an absolute MUST for every home, classroom and library collection. Want the book? Get it here! 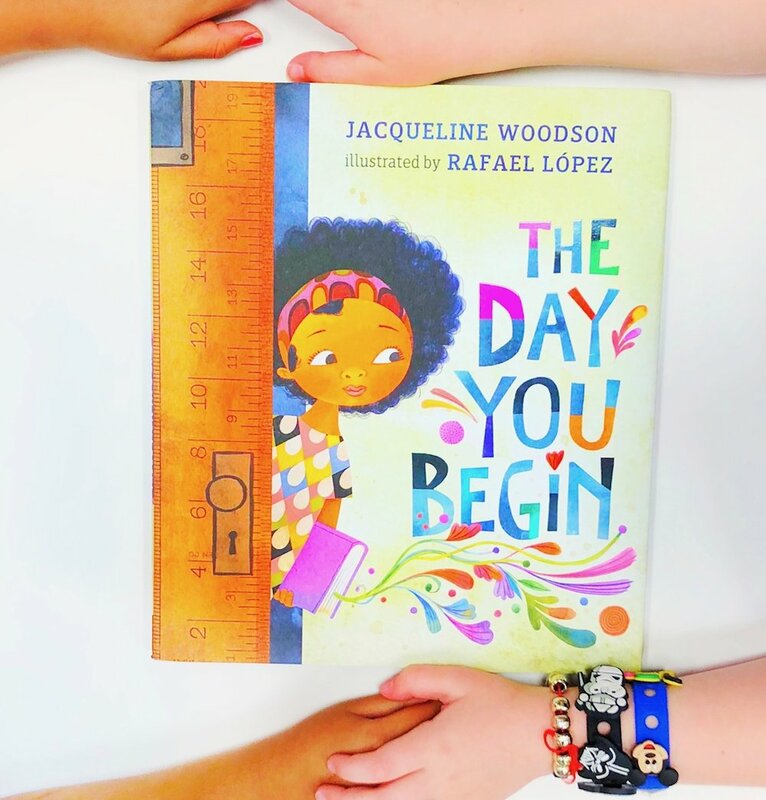 The Day You Begin, by Jacqueline Woodson and illustrated by Rafael Lopez. *This is an affiliate link. HEE received an advanced review copy of this book, but all opinions expressed herein are entirely our own. So many of you have asked about books to help you discuss the news with your kids. Why? Because no matter whether we like it or not, we all experience the same thing, time and time again. Some day, somewhere, something happens and we feel immobilized by grief, anger, and even helplessness. Our kids understand that something in the news has affected us profoundly, but it’s not always easy (or age appropriate) to tell them about the latest current event. So what do we do? What do our KIDS do? 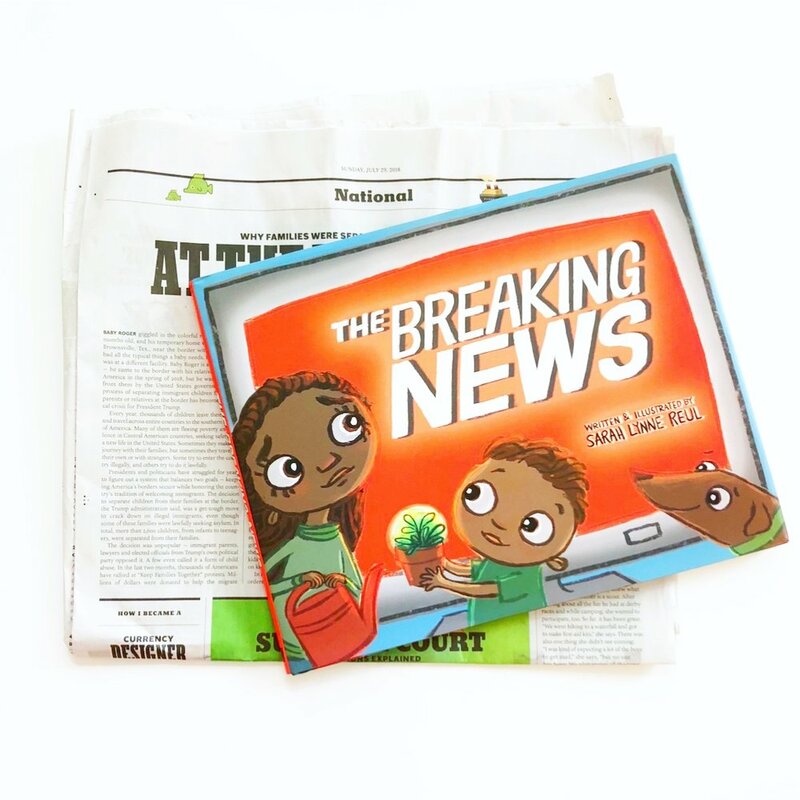 In Sarah Lynne Reul’s The Breaking News, a child’s community is rattled when devastating news strikes it at its core. The news leaves the adults in the neighborhood exhausted and distracted. At school, the child's teacher tells her class to look for the helpers in times of distress. The girl wants to be a helper. She wants to help her family and her community in as big a way as she can- until she realizes that maybe one small act of kindness is all she needs to do to make a difference. I absolutely adore The Breaking News. I love how it offers a child-centric perspective on family and community upon the receipt of bad news as well as the manner in which the child seeks to positively impact her community afterwards. Though our children may not always understand the “adult” events that happen around the world and even in our own backyards, they are undoubtedly impacted by our distress. Many of these kids don’t know how to help, but they so desperately do their best to try. The Breaking News beautifully illustrates that kids may not be able to fix major challenges, but they can absolutely contribute to brightening the world around them in small, simple ways. This is a timely story that parents and teachers will want in their collections for those tough situations when our own words fail us but a perfect book opens the door for education and understanding. Want the book? Get it here! The Breaking News by Sarah Reull. *This is an affiliate link. Wow. WOW. My gosh, was this book fantastic! Amal Unbound was an emotional, powerful story, one I read so quickly because I simply could not put it down. Set in a poor Pakistani village with themes of social hierarchy, education, and indentured servitude, this was a searing "window" book that opened my eyes to the tragic circumstances and sacrifices that children in some communities must experience to save their families from ruin. 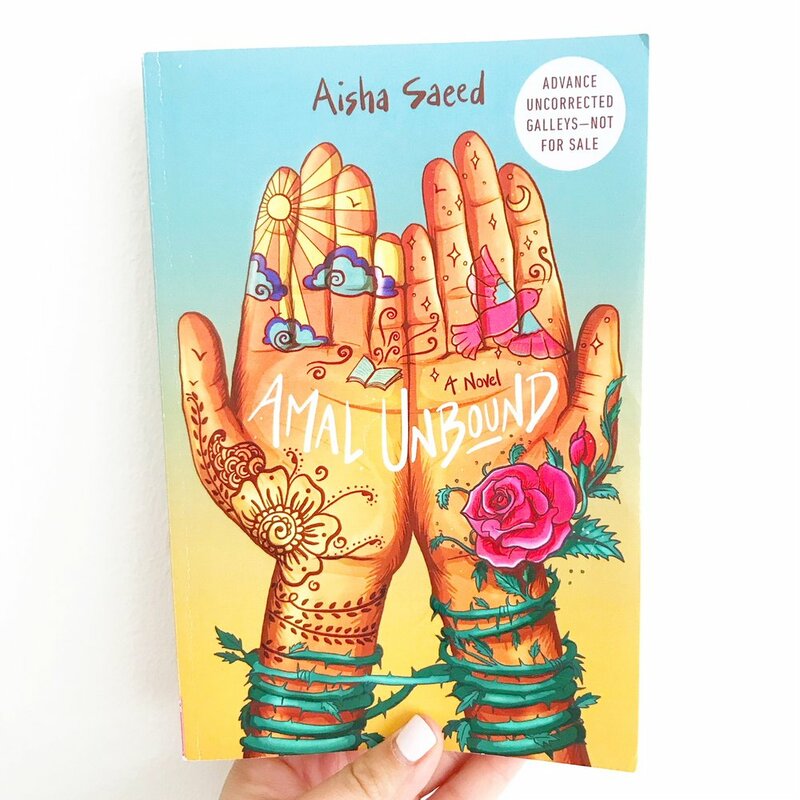 Amal Unbound, elegantly written by Aisha Saeed, is the story of Amal, a bookish, smart girl with dreams of becoming a teacher. But one day at the market, Amal mouths off to the wrong man: Jawad, son of her village’s wealthy landlord. In order to pay off the debt for her insulting behavior, Amal is forced into indentured servitude with his family, leaving her own family behind. At the landlord’s pretentious home, Amal sees firsthand the dangers of illiteracy and gender inequality, and she begins sneaking books from the library and teaching others to read. When Amal is sent by the family to be a patron at the village's new literacy center, she recognizes that her education has given her a powerful hand- the ability to take a critical stance against corruption. A poignant exploration of unjust power structures and the extreme consequences families must endure to repay debts for “poor” behavior, Amal Unbound will be an eye opener for so many students. It is an important testament to the power of education and the way words can change worlds and correct damaging social injustice and corruption. Knowledge is power, and literacy, in this story, truly becomes Amal’s key to freedom. This is an important read for all upper elementary and middle school students students -- a story of literacy, resistance and, ultimately, sweet sweet justice. Amal Unbound is hands down one of my favorite middle grade novels of 2018 so far. Two trunks up! Want the book? Get it here! Amal Unbound, by Aisha Saeed. *This is an affiliate link. Happily Ever Elephants received an advanced review copy of this book, but all opinions expressed herein are entirely our own. There's this funny thing about kids today that I don't really remember from when I was younger. Everyone seems to be overscheduled. Between sports practice and tutors and language lessons and music lessons and theater lessons and voice lessons, when do we expect our children to play? Play, after all, is what childhood is all about - that's where the magic happens, where kids come into their own and learn who they are and develop cognitively, emotionally, creatively, and even physically. Perhaps that's why I so loved Moon, the new book written and illustrated by Alison Oliver, illustrator of the prominent babylit board book series. In Moon, Moon is a young girl who leads a busy, busy life between school, homework, music lessons and other afterschool activities. One night, though, she goes astray when she happens upon a wolf. The wolf takes her deep into the forest where Moon gets a little lesson in letting loose -- how to be wild, how to be free, and how to howl. And once she learns how good it feels to live a little, Moon doesn't want to let go. Oh, what a joyous book Moon is! At a time when our children seem to carry the world on their shoulders, this is a glorious story reminding both kids and parents alike to take a step back, breathe, and play. Today's society seems to be putting way too much pressure on children to succeed at such tender young ages, and we are forgetting a very basic but extremely important notion: let them be little! Let kids be KIDS! With its simple text and stunning illustrations, Moon is a lovely celebration of play, nature, and the revitalizing affect that embracing our inner wild can have on our well-being. Want the book? Get it here! MOON, by Alison Oliver. *This is an affiliate link. HEE received an advanced copy of this book, but all opinions expressed herein are entirely our own.